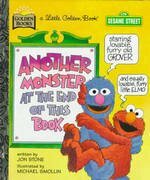 In this vibrantly illustrated sequel to the much-loved The Monster at the End of This Book, Grover, now accompanied by Elmo, has heard that there’s something lurking on the last page of the book. Grover invents all sorts of hilarious ways to stop the reader from turning the pages. But Elmo is curious, and he slips by every wacky barrier in his quest to see what he might find.